A couple of weeks ago I was reading a post by my favorite blogger, Bhavna Hinduja, author of Bhavna Hinduja on Being Simple, Sustainable & Mindful. 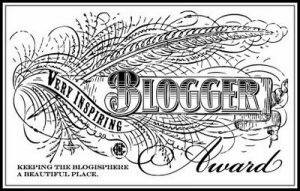 I was thrilled to see that she had been nominated for the Very Inspiring Blogger Award. What I wasn’t prepared for was to read on and find that she had nominated me for the award as well. Bhavna,thank you, I was, and still am, so grateful for your nomination! Having only been a blogger for about a year and a half I really wasn’t sure what this meant. So I did what any good student would do and “Googled it.”. There I found a list of blog after blog who have received a nomination for this award. All I could think was, “How cool.” Honestly, I didn’t continue my research to learn more, and I realized that I don’t care whether there is a real award or not. I love the concept and I love the rules. It was such a good feeling to receive this nomination and now I get to share that feeling with others, “pay it forward” so to speak. Notify those bloggers of the nomination and the awards requirements. 1. I wear my heart on my sleeve. I’m horrible at hiding my emotions. This can be a blessing and a curse. 2. I love alone time. This is my time to read, write and go exploring with my creativity. 3. I never get tired of the Blues. I loved “sap tunes” (as in sappy love songs) in junior high, Prince and hair bands in the 80s, but regardless of the year, I have and always will love listening to the Blues. 4. My right leg is shorter than my left. Not drastically, about 1/2 inch. Just enough to make my spine curved and my purse constantly fall off my right shoulder. 5. I have a tattoo. Didn’t get it in my teens or 20s, got it in my 30s. I wanted it to mean something. Don’t regret it yet. 6. I love to write, but only discovered it a year and a half ago. Yep. Never thought of myself as a writer. Started writing on a whim and completely fell in love. Don’t do it often enough. 7. My circle of friends is small and close. I know a lot of people and have a lot of acquaintances, but my circle of friends is small and I keep them close. If I call you my friend, I will defend and protect you like a momma bear defends her cubs. Gardening in the Lines | a diary of gardens.